There’s something magical about sitting on top of an excavator and looking at the 66km2 beautifully destructed landscape surrounding you, as accordion music from another silenced digger reaches your ears, with in the background a rainbow coming out of yet another halted coal-scraping monster in the distance. Almost like nature is saying “thank you”. In the middle of May over 4000 people from all over Europe gathered in the Lusatia region in Eastern Germany. The plan? 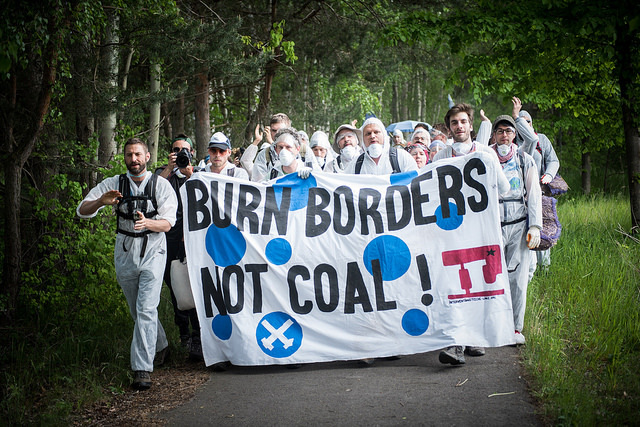 To block a Vattenfall-owned opencast lignite mine. Germany, as a part of the European Union, was one of the 195 countries that signed last December’s global climate deal in Paris. The pact included the non-binding agreement by governments towards “a long-term goal of keeping the increase in global average temperature to below 2°C above pre-industrial level”3, as well as make an effort to keep global temperature rise below 1,5°C. According to science magazine Nature, staying below 2°C means 88% of global coal reserves need to stay in the ground4. When it comes to climate change, Germany has great ambitions. It is in the process of an ‘Energiewende’, an energy transition towards renewable energy, reducing dependence on fossil and nuclear energy, and its planning to almost completely eliminate its emissions by 2050. But still, it is one of the world’s biggest lignite producers. Lignite – or brown coal – is the most CO2-intense fossil fuel of all, and besides polluting drinking water and damaging local ecosystems, its extraction means saying goodbye to villages, forests, arable lands, and anything else in the territory. Further, burning it produces particulate matter, mercury and uranium, which cause chronic diseases and affect the respiratory system5. Energy source for the future, anyone? 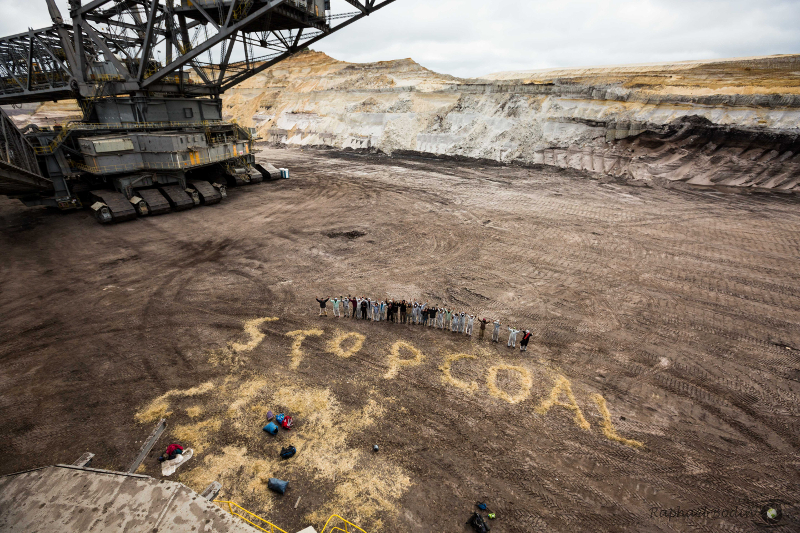 August 2015 was the first time a mass action of civil disobedience against lignite mining was organised by ‘Ende Gelände’, a broad alliance of grassroots climate action groups, environmental organisations, left political groups, and allies in the struggle against coal and nuclear power6 in Germany. 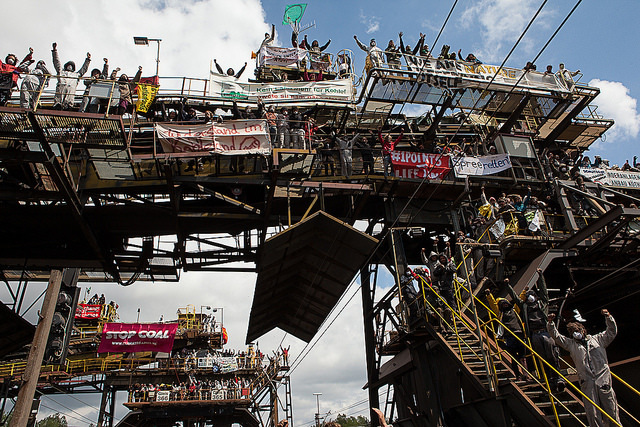 The action’s name and often-chanted slogan ‘Ende Gelände’ loosely translates to ‘Here and no further’, indicating the need to stop coal extraction in order to halt climate change, putting people and climate before profit. Last year, the action took place in the Rhineland region in the west of Germany. About 1500 people took part in the action, bringing the mine to a halt for a day. 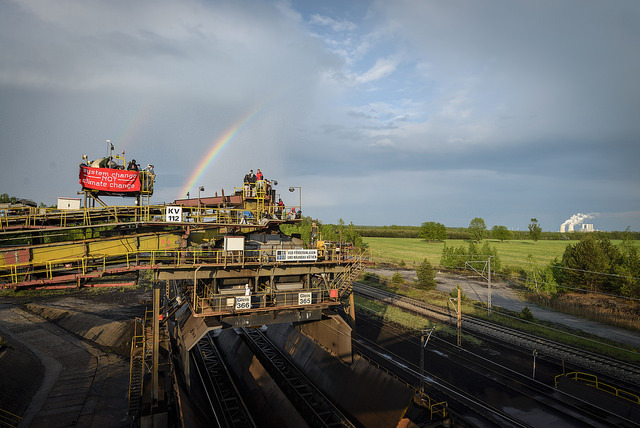 This year, people power moved to the Lusatia region, where the struggle against lignite has been going on for decades. In the past, 136 villages with over 30,000 residents have already been partially or completely displaced to make way for lignite extraction8. Since 2001, Swedish company Vattenfall has been operating five open-cast mines in the region and had plans to open another five, meaning 3,4009 additional people would have to leave their homes and see their homeland destroyed. This year’s action, too, was a success. Starting Friday afternoon, action ‘fingers’ with hundreds (sometimes over a thousand) of people went down into the pit, to the loading station, towards railway tracks or to the power plant. Different strategic places were occupied for over 48 hours, preventing the giant diggers from extracting, the conveyor belts and the railway tracks from transporting coal and the power plant from burning it. And thus releasing CO2, particulate matter, mercury and what not, into the air. Different power stations in the area were forced to curb their production, the power plant ‘Schwarze Pumpe’ by up to 79%. In total, more than 20,000 tons12 of CO2 emissions were avoided during the action. In the context of Germany’s Energiewende, the future for lignite looks bleak. In July 2015 the government decided to close around 13% of the country’s oldest lignite power plants by 2020. Further, renewables are becoming cheaper, whilst fossil fuels in Germany remain heavily subsidized14. As potential investors most probably also understand the limited future for lignite in Germany, Vattenfall had a difficult time attracting buyers. One eager buyer, however, was the Czech energy company ‘Energetický a průmyslový holding’ (EPH), which seems to be working on European enlargement. In 2014 it took over an important UK-based coal-fired power station19, and in 2015 it acquired all of E.ON’s coal and gas plants in Italy20. The company already operates lignite infrastructures in Germany and various other European countries21 and seems to be the European Union’s key importer of natural gas22. Nuclear energy, too, appears on its list of future projects23. The company’s owner is oligarch Daniel Křetínský. He is co-owner of the Czech News Center media house, which produces two of the biggest Czech tabloids. ‘Wonderful Yacht Holdings Ltd’ is also under his name: one of the companies mentioned in the ‘Panama Papers’24, the millions of documents with financial information of various offshore companies that leaked earlier this year. For the purchase of the mine, EPH partnered up with investment company PPF Investment. PPF is controlled by Petr Kellner, the richest man of the Czech Republic, who was also found to have property and business activities on the British Virgin Islands25. The deal between Vattenfall and EPH/PPF was signed in April this year and includes all Vattenfall’s lignite mines and plants in Germany. Now it is up to the Swedish government to approve the deal26. Bad news for EPH/PPF, though, is that resistance against coal in Sweden is growing stronger. In 2014 already, the majority of Swedes agreed that Vattenfall should cancel its plans for new lignite pits and that the company should make a complete shift from fossil fuels to renewables27. Opposition against the sale of the mine has even sneaked its way into the Swedish business world. ‘Dagens Industri’, an important Swedish business paper, published an article entitled “The environmentalists are right about Vattenfall”28 in March this year, followed by a series of similar claims during spring. On the 3rd of June, a national demonstration will be held against the deal29. See also this clip of a recent protest in Stockholm. For Vattenfall it is clear it needs to get rid of coal somehow, so the crucial question to ask here is one for EPH: why would a company invest in an energy source with such an unclear future? Jan Špringl, EPH Board member, believes lignite “will be the only fuel providing baseload power in Germany” after 202230. The buy thus seems to be built on the confidence that lignite will continue to play an important role for Germany’s future energy mix. Mr. Špringl adds: “We are convinced that we can contribute to reaching the Energiewende targets.”31 And how exactly were you planning on doing that, Mr. Špringl? If Germany is serious about its energy transition away from coal, there is no future for lignite. Period. However, could it be that EPH will follow in Vattenfall’s ISDS-footsteps? ISDS or Investor-State Dispute Settlement is a mechanism included in various trade agreements, which ensures profit-making for big business. This tool offers the opportunity to foreign investors to sue domestic governments in international courts for daring to take decisions that might threaten their future profits – even if the decision is in the public interest. Payouts can be in the billions. A recent ISDS case is the one of Keystone XL, a 2000-mile-long pipeline that would transport Canadian tar sands to US refineries on the Gulf Coast. This project to transport this black and sticky, very dirty kind of oil – very expensive and energy- and water intensive to process – was proposed by TransCanada32. Following public protest, US president Obama was forced to reject the project, to the displeasure of TransCanada. As a consequence, TransCanada decided to sue the American state under the North American Free Trade Agreement (NAFTA), demanding $15 billion in compensation for lost future profits. If TransCanada wins, this money will eventually be paid by American citizens. Vattenfall is one of the most famous users of ISDS, having already sued the German state twice: once when the city of Hamburg dared to tackle water pollution from its coal plant, and the second time for the German government phasing out nuclear energy after the public outcry following Fukishima, which it claims will cost it more than €3.7 billion33. The first case – Vattenfall v. Germany (I) – was settled in the spring of 2011. The second case – Vattenfall v. Germany (II) is still pending. If Ende Gelände is successful and the German government decides to phase out of coal tomorrow, could EPH use the Energy Charter Treaty in Europe to sue Germany yet again? However, let it be clear, people power will not just keep fossil fuels in the ground, but also overthrow unjust and ecologically suicidal trade pacts. Ende Gelände! Vattenfall, or EPH/PPF, if you’re still not decided on future activities, maybe one of the Ende Gelände banners can inspire you? 12Calculated by Charles Adrien Louis, B&L Evolution.